There are not many – but you will encounter a few pests and diseases with camellias. Prevention is worth an ounce of cure in most cases. 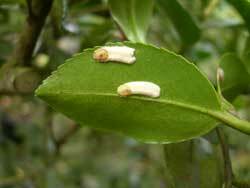 Scale insects and Mites are both insects that can attack your camellias. Both usually start at the underside of the leaves. Scale is noticed by its white powdery substance under the leaves and results in a yellow mottled appearance to the upper leaves. If left untreated- it can spread to all parts of the plant and nearby plants as well. Mites are actually spider-mites. They live and reproduce on the underside of the leaves are visible by their faint dust like appearance. Their damage causes a bronzing look to the upper side of the leaves. Both of these insects can be controlled with regular treatments with oil spray or insecticides. Aphids are small green ant-like insects that are usually visible in the spring when the new growth appears. 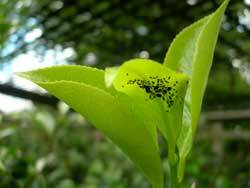 You can treat with insecticides to control aphids which can damage the foliage on your camellias. Aphids also attract ants that feed on their secretions. The most common symptom of aphids is the black sooty mould which can be found covering the top of leaves. The only cure for this is to treat with insecticide and then wipe the mould from each leaf. Its a tedious job, but well worthwhile. Treat again with insecticide in early Spring to avoid a repeat infestation. Petal blight is a disease of the blooms that usually appear in February or March of each year. 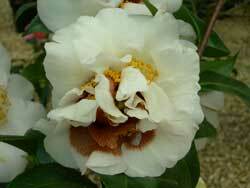 It is characterized by brown splotches that can leave blooms with an undesirable appearance. There is no cure for petal blight and picking up blooms will only minimize the problem as spores can travel by the billions up to 5 miles away! Planting early blooming varieties can give you some relief from Petal Blight. Dieback is a common disease and affects some camellias more than others. It is spread by splashing water, wind or unclean pruning shears. The spores enter through wounds on the plant and can cause limbs to “die” . If infected in the lower part of the plant, entire plant death could occur. It can be prevented by sanitation, disinfecting pruning shears, and possibly the use of a fungicide if you think you have problems with dieback to prevent it from spreading to other plants.